WOULD-BE terrorists killed four police officers and a military informant during the year, but the low death toll masked a high level of activity, much of it focused on getting to Syria. By December, 110 Indonesians had been identified as having gone to Syria to fight since mid-2013, including wives but not including those who went only briefly on humanitarian missions. Most left to join the Islamic State of Iraq and Greater Syria (ISIS), later simply called the Islamic State (IS), but some joined rival forces, including the al-Qaeda-linked al-Nusra Front. By mid-2014, concern was growing in government circles over how to prepare for the possible return of experienced mujahidin with the potential for revitalizing the jihadi movement at home. ISIS-linked issues were not the only concern: the resurfacing of Jemaah Islamiyah as a well-structured organization with a systematic recruitment and training agenda was also a worry, as was the ongoing lack of clear strategy for counter-radicalisation efforts. ISIS, however, attracted all the attention, particularly after its recruitment video, Joining the Ranks, was posted on YouTube on July 23, with an Indonesian fighter, Bahrum Syah, urging others to join the Islamic State. Officials in Jakarta saw this as a direct challenge to the Indonesian republic and on August 4, ‘banned’ ISIS. In the absence of any law or regulation outlawing membership, however, the ‘ban’ was little more than a policy directive. To this day, Indonesia has few tools at its disposal to deter people from pledging loyalty, travelling to Syria or coming back as combat-hardened fighters. Many of the ISIS recruits were followers of imprisoned cleric Aman Abdurrahman. Others had links to jihadi coalitions such as Mujahidin Indonesia Timur (MIT), led by Santoso in Poso, or Mujahidin Indonesia Barat (MIB). Several fighters left from universities in the Middle East and Pakistan, including alumni of extremist schools such as Abu Bakar Ba’asyir’s Pesantren al-Mukmin in Ngruki, Solo, and Pesantren DarusySyahada in Boyolali. Entire families began to leave, attracted by the promise of stipends, furnished apartments and free medical care as described by friends over Facebook and Twitter. Prisons were also an important venue for information exchange, with a few convicted terrorists in the Nusakambangan complex and in Malang and Surabaya prisons having links to facilitators on the outside, the contacts for which they provided to visitors on request. Several inmates made plans to go to Syria after their release. Some made it safely to the front, at least one died as a suicide bomber and one led a group of 12 that was caught in Malaysia in early December and faced deportation back to Indonesia. As the Jokowi administration took over, confusion over numbers increased, with newly appointed officials misreading or misinterpreting data and their statements then getting picked up by the local media. A senior BNPT official said in early December that the number of Indonesian ISIS fighters had been 86 in June “but soared to 264 in October.” The problem was that the sources for the two figures were different. The ‘264’ figure included unconfirmed, unidentified clusters (e.g. ‘group of fifteen’) as well as everyone known to have travelled back and forth with Islamist humanitarian organisations; the ‘86’ was from a different source that only counted known fighters and that by December, had expanded its estimate to 110. The figure ‘514’, used by the first source to estimate the number of ISIS supporters in Indonesia (but without any explanation for how it was arrived at or how ‘supporter’ was defined) was picked up by some local media as if it were the total number of Indonesian ISIS members in Syria. The ‘110’ figure somehow was misread by the new Coordinating Minister for Political, Security and Legal Affairs as representing the number of foreign fighters in Poso. Rivalry between ISIS and the al-Nusra Front blew back to Indonesia, dividing friends and families, particularly after ISIS leader Abu Bakr al-Baghdadi announced the establishment of a caliphate on 1 Ramadan (June 29, 2014). Propaganda from the pro-ISIS side was posted on the website www.al-mustaqbal.net, while www.arrahmah.com featured anti-ISIS tracts. JI rejected the caliphate on the grounds that ISIS was only an organization,not a state and that al-Baghdadi had not been chosen by a religious council. Majelis Mujahidin Indonesia (MMI) took a similar stance. Jamaah Anshorul Tauhid (JAT), founded by Abu Bakar Ba’asyir when he left MMI in 2008, split down the middle, with Ba’asyir leading the pro-ISIS side and the majority of anti-ISIS members forming a new organization, Jamaah Anshorul Syariah (JAS). 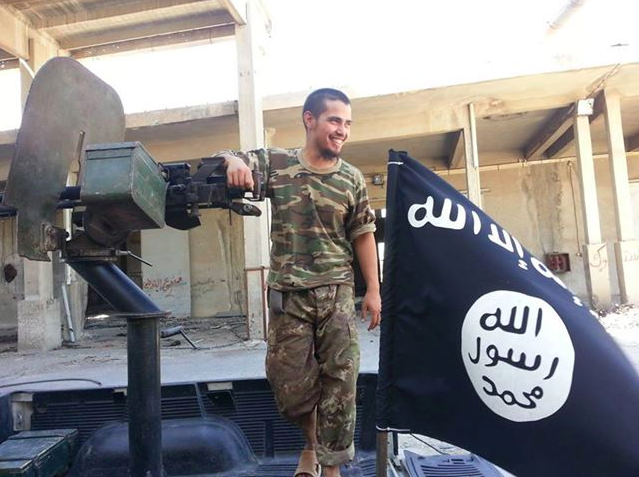 Ba’asyir’s own sons came out against ISIS, breaking with their father. Prisons with convicted terrorists also divided into rival camps, but with constant shifts and realignments. Meanwhile, the country continued to have pockets of violent extremism that would not go away. One was indeed in Poso where Santoso, the self-styled ‘Zarqawi of Indonesia’also known as Abu Wardah as-Syarqi, was holed up on a mountaintop, not with 100 foreigners but with an estimated 30 local armed men. He was the first Indonesian to pledge allegiance to the new caliphate and continued to get videos posted on YouTube, most recently in October, railing against the police. Several alumni of his training courses are now in Syria and he has become the symbolic center of ISIS in Indonesia, largely because of his own self-promotion. Extremist cells were active across West, Central and East Java and in North Sumatra, Lampung, South Sulawesi and Nusa Tenggara Barat, not so much in planning terrorist actions but in recruitment, indoctrination and quasi-military training, sometimes involving weapons but in their absence, a combination of outdoor fitness, martial arts, map-reading and other skills. Some of these belonged to pro-ISIS groups, but the anti-ISIS cells warranted attention as well. The arrests of seven young men in Klaten, Central Java, in May revealed that JI, which had moved away from violence in 2007, had begun quietly reactivating its old network in 2010-2011 and was now beginning to collect weapons and explosives. It was actively recruiting on college campuses, aiming at attracting well-educated professionals including chemical engineers, information specialists, doctors and even nuclear technicians. The question, left unanswered as the year came to a close, was toward what end JI continued to reject violent attacks in Indonesia as counterproductive—not illegitimate—with the costs outweighing the benefits, but it was not clear when or how that assessment would change. With all this, counter-radicalisation efforts remained weak. At the National Anti-Terrorism Agency (Badan Nasional Penanggulangan Terorisme, BNPT), the prevention side, led by a senior military officer, remained largely divorced from the operations side, led by the police. ‘Deradicalization’ programs were not well-targeted and were often premised on the assumption that the core of the problem was insufficient nationalism. Little work had been done to collect examples of communities that had taken back mosques and schools from extremist clerics and understand the dynamics involved, or even to set policies ensuring, for example, that leaders of discussion groups in mosques on government premises be vetted. By the end of the year, the Corrections Directorate of the Ministry of Justice and Human Rights had embarked on some good new initiatives to train prison personnel to identify and manage high risk-detainees, but the lack of a good program for post-release monitoring was still a concern. Some 80 convicted terrorists were released in 2014, many of them for minor, non-violent roles such as harboring fugitives. A slightly higher number were expected to be released in 2015-16, including some potentially serious troublemakers. The Jokowi government has thus far produced no clear message,let alone strategy on countering terrorism, but it needs to recognize that the only institution with reliable information is the counter-terrorism unit of the police, Detachment 88. It is not without flaws and there are legitimate questions about the high rate of deaths in its operations against suspected terrorists. But its intelligence is second to none, and the key to any effective program is accurate data. The dominance of the military among Jokowi’s security team could lead to pressure from within the Cabinet and/or parliament to include institutions other than the police in the effort to reduce ISIS influence. But if the mistakes in basic numbers on fighters in Syria are any indication, bringing new actors into the mix is not going to help. President Jokowi can change many policies and personnel in Indonesia for the better. Counter-terrorism is one where he should stay with the players who know what they are doing. This piece was originally published in the 5 January 2015 edition of English Tempo magazine.